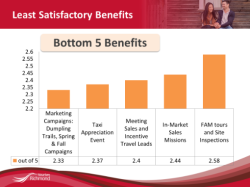 Tourism Richmond held a strategic planning session in early May and identified the need to conduct an annual stakeholder satisfaction survey. We formed our survey based on similar surveys from Destination BC, Tourism Vancouver and Tourism Victoria, and sent out a total of 382 surveys to our existing and past members, with 84 surveys returned. The survey collected information that included general business profiles, an overall satisfactory score, the importance and the satisfactory level of stakeholder benefits for each business, the awareness of tourism marketing activities in the community, and an open comment section for our stakeholders to voice their concerns and questions. From the 84 surveys collected, we found out that our relationship with local tourism businesses needs to be strengthened, with an average satisfaction average of 3.58 out of a possible score of 5. From our stakeholders’ comments, we found that a website that drives business to them, our annual visitor guide and map, the calendar of events on our website, and social media campaigns are very useful to tourism businesses in Richmond. Based on this feedback, we will concentrate our efforts on programs that deliver what our stakeholders need from Tourism Richmond to help drive business to their businesses. We were advised by our stakeholders that there is an opportunity to improve on sales lead generation and referrals, enhance in-market sales mission, and enrich our FAM tours and site inspections. Based on feedback, we have concluded that we must continue building a strong digital presence; create value added campaigns for the local tourism businesses; and ensure our partners get more opportunities to be involved with us and understand why Tourism Richmond’s role is important to them. Together we can form a true Team Richmond; a partnership with our stakeholders that enhances value and relevancy for all. Our next satisfaction survey will be sent out in 2018, with our primary goal of increasing our satisfaction average from 3.58 to 3.75+. 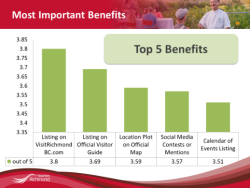 Between now and 2018, Tourism Richmond is committed to creating programs that are relevant and usable by our stakeholders and tourism businesses in Richmond. If any questions or comments, please feel free to contact Carol Yeh at cyeh@tourismrichmond.com.